Season 3 of Twin Peaks is returning this Sunday, May 21, 2017, after more than 25 years of being off the air. Those of you familiar with my channel have likely already watched my video for my Twin Peaks Black Lodge Cherry Pie, but I wanted to do something a little different to celebrate what I believe is going to be the greatest comeback in TV history. 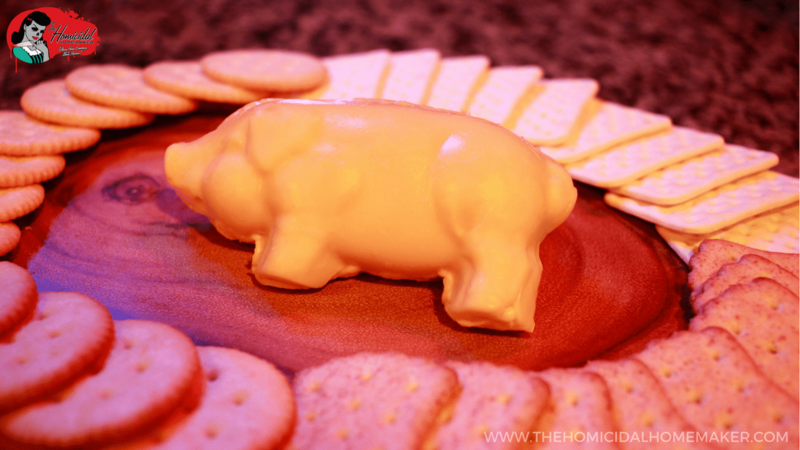 After searching high and low to no avail for a Smoked Cheese Pig for my Twin Peaks Season 3 Party, I set out to make my own…as a cheeseball! Watch this video to learn how to make three Twin Peaks recipes that will make your guests say, “Wow, Bob, Wow!”: Jerry Horne’s Smoked Cheese Pig (as a cheeseball! ), Brie & Butter Baguettes with Cherry Pie Chutney, and my Leland Palmer Cocktail – a crazy, boozy twist on a traditional Arnold Palmer, with a splash of blood…er, cherry syrup! Don’t forget to make my Twin Peaks Black Lodge Pie for dessert! This Twin Peaks Smoked Cheese Pig is delicious served with fresh veggie sticks, crackers, sliced baguettes, and cured meats. It also pairs perfectly with an ice cold brew. If you thought this was a DAMN FINE episode, please be sure to hit that ‘subscribe’ button on my YouTube channel, and give it a Dale Cooper ‘thumbs up’ of approval! 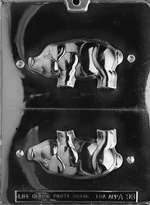 I purchased my pig mold from Amazon. If you purchase from this link, it helps support the show/website! First, make sure all of your cheeses have set out at room temperature for at least an hour. This makes it easier to blend them together. Using a mixer, combine the Velveeta and cream cheese. Add in the shredded cheese. Then add in the spices, and liquid smoke and Worcestershire sauce to taste. Then, spoon the mixture into your mold. You can either spray the mold with cooking spray, or line it with plastic wrap for easy removal. Chill in the refrigerator until firm, then remove. If your mold comes in two halves, use a little bit of the remaining room-temperature mixture to hold the two halves together, and then place bag in the refrigerator until ready to serve. Serve with crackers or veggie sticks. ©Copyright 2010-2018 The Homicidal Homemaker® - All rights reserved. No content may be redistributed, copied, or modified without express written permission. No recipe or tutorial may be used for profit or any other commercial use.